Here at Fernhill Farm, we have a variety of different accommodation options, from camping out in the fields to our four-poster bridal suite and pretty much everything in between. Whether you are looking for quiet sanctuary or wish to celebrate in style, our truly unique surroundings are perfect for all occasions. Ideally suited to groups of 10 or more, with 40 beds and unlimited camping on-site, we pride ourselves on offering cosy accommodation with social spaces. Please get in touch so we can discuss your requirements. For larger events, please go to our events page. Hive Hall can be used as an event space or bunk accommodation for 18. It is frequently used as a space for wedding ceremonies and main meals as well as raucous parties. Wren Cottage can sleep up to 8 with a king, double and four queen single bunks. The Horseshoe barns are all one building with connected rooms. The layout of the barns, from left to right, starts with Wren Cottage (see below) leading through a hallway with washroom into Hive Hall which is the main function space. Another hall with washroom lets out to the bar, which leads through to the dining area and adjoining catering kitchen. All rooms have direct access to the courtyard outside with a large fire pit area. 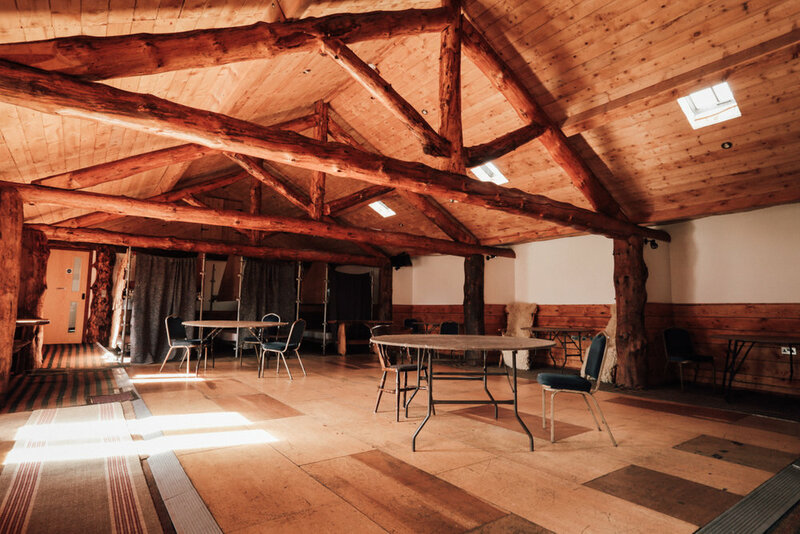 This is such a versatile space and can be used in many ways including weddings for up to 100, functions, catering events, stag and hen weekends, conferences, retreats or a weekend away with friends. Get in touch if you want to discuss your plans. We’re always happy to chat and to advise you on the possibilities. Wren cottage is so named as it is where the wrens would nest before the barns were brought back from their previous dereliction. 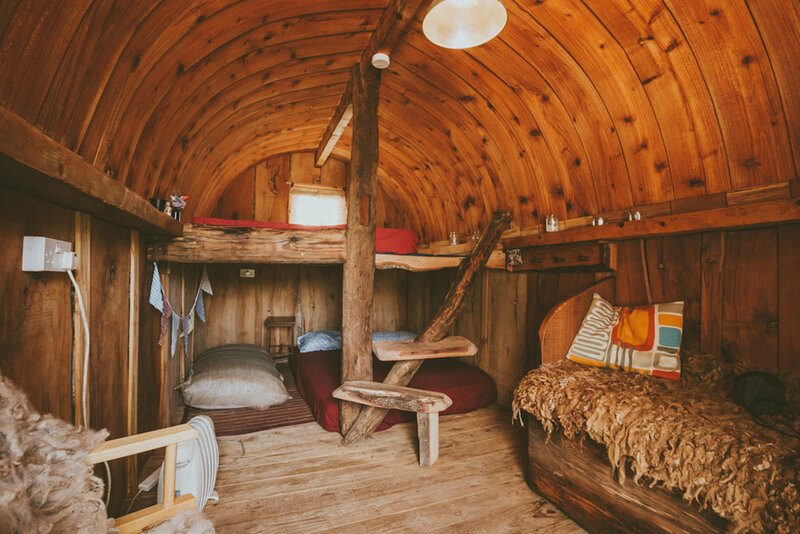 Decked out in typical Fernhill Farm style with wool and reclaimed wood furnishings, they are a perfect den for a family or small group that are staying as part of a larger event in the Camping Barns. 2 king beds and 4 queen single bunks built from reclaimed timbers. The secluded Basement is the most private accommodation option available at the farm and is often used as the bridal suite for weddings. Facilities include a four-poster bed, large, beautifully tiled wet-room with power shower and a self-contained lounge and kitchenette with a sofa bed. There is private access and underfloor heating throughout. The Loft is perfect for small groups and families, or as a second accommodation base for larger groups. This self contained apartment sleeps 6+ and consists of a spacious lounge, fully equipped kitchen and dining area, master bedroom with king-size double bed, second bedroom with a set of queen bunks and a double bed, plus a private bathroom. Situated up two small flights of stairs above the Ag shed, it has lovely views across the farm. The loft is centrally heated but also has a log burner for warm, relaxing evenings. It is a cosy, child-friendly space with plenty of natural light. The Ramshackle Arcs ( Fernhill’s version of a Shepherd’s Hut ) are available to book individually or as add-on accommodation for larger groups. We have three unique Arcs available. Each Arc sleeps four or more guests on queen mattresses and are beautifully hand crafted from timber milled here on the farm. Insulated by wool, these arcs are warm and cosy even in the winter months. Camping facilities are offered only when attending another event or function taking place on the farm. We have space for unlimited BYO bed options: tents, live-ins and caravans are all welcome. Access to showers, loos and fresh water with provision for some electrical hook-up if essential. Dogs are not permitted – £25 spot fines will be issued for contraventions. If you are looking for free-range camping in Cheddar then contact Petruth Paddocks where they have ample flat fields, can welcome dogs and allow campfires. The on-site Static Caravan is fitted out with its own loo, kitchen and log burner. Ideal for a couple wanting a weekend getaway up on the Mendips or as accommodation for a non camper that is part of a group using the camping field. Contact for availability.